Tais is a very special friend from college who became a friend for life. Oh this is friendship! – as we used to say, right Tatá? And Maite is her daughter, who I luckily got to know the last time we’ve been to Brazil. She is so adorable and lovely, that I can only think of her as a Sweet Maitê. 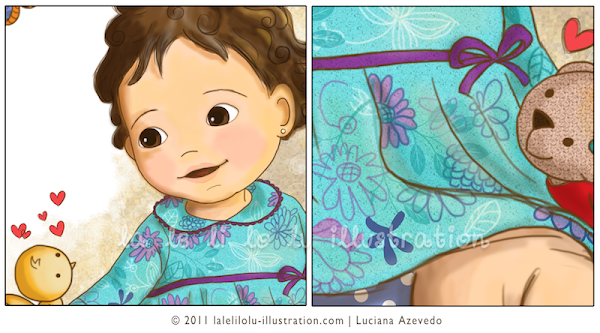 Taís also writes a blog, Tudo de Bombom, where she tells more about her sweet Maitê and her life as mom and geologist. Ai Luuu, fala sério!! Que coisa mais linda!! Amei. Sou muito fã do seu trabalho! Que fofo!! Menininha doce mesmo! Ja fui la no blog conhece-las. Aproveito para desejar um feliz dia das mães!!! Que trabalho perfeito!! A tetê ficou igualzinha… cada detalhe! o brinquinho, o olhar… os bichinhos, que é o que a Maitê mais curte! Como voce faz isso ? ?